Choosing the best treatment for a cancer patient is often an inexact science. Drugs that work well for some patients may not help others, and tumors that are initially susceptible to a drug can later become resistant. In a new approach to devising more personalized treatments, researchers at MIT and Dana-Farber Cancer Institute have developed a novel way to test tumors for drug susceptibility. Using a device that measures the masses of single cells, they can predict whether a particular drug will kill tumor cells, based on how it affects their growth rates. The researchers successfully tested this approach with a very aggressive type of brain cancer called glioblastoma and a type of blood cancer known as acute lymphoblastic leukemia. They reported their results in the Oct. 10 issue of Nature Biotechnology. “We’ve developed a functional assay that can measure drug response of individual cells while maintaining viability for downstream analysis such as sequencing,” says Scott Manalis, the Andrew (1956) and Erna Viterbi Professor in the MIT departments of Biological Engineering and Mechanical Engineering and a member of MIT’s Koch Institute for Integrative Cancer Research, who is one of the paper’s senior authors. David Weinstock and Keith Ligon of Dana-Farber Cancer Institute are also senior authors of the paper. The lead authors are Mark Stevens, a former MIT graduate student who is now a research scientist at Dana-Farber; MIT graduate student Nigel Chou; and Dana-Farber postdocs Cecile Maire and Mark Murakami. In recent years, scientists have been trying to identify genetic markers in tumors that suggest susceptibility to targeted cancer drugs. However, useful markers have been found for only a small percentage of cancers so far, and even when there is a predictive test, it is not accurate for all patients with that type of cancer. The MIT and Dana-Farber researchers took a different approach, inspired in part by a test that has been used for decades to choose antibiotics to treat bacterial infections. The antibiotic susceptibility test involves simply taking bacteria from a patient, exposing them to a range of antibiotics, and observing whether the bacteria grow or die. To translate that approach to cancer, scientists need a way to rapidly measure cell responses to drugs, and to do it with a limited number of cells available. For the past several years, Manalis’ lab has been developing a device known as a suspended microchannel resonator (SMR), which can measure cell masses 10 to 100 times more accurately than any other technique. This allows the researchers to precisely calculate growth rates of single-cells over short periods of time. In this study, Manalis’ lab worked with Dana-Farber researchers to determine whether drug susceptibility could be predicted by measuring cancer cell growth rates following drug exposure. The team analyzed different subtypes of glioblastoma or leukemia cells that have previously been shown to be either sensitive or resistant to specific therapies: For glioblastoma, these are drugs called MDM2 inhibitors, and for acute lymphocytic leukemia, the drugs are known as BCR-ABL inhibitors. This allowed the researchers to test whether their approach would yield accurate predictions. After exposing cancer cells to the drug, the researchers waited about 15 hours and then measured the cell’s growth rates. Each cell was measured several times over a period of 15 to 20 minutes, giving the researchers enough data to calculate the mass accumulation rate. They found that cells known to be susceptible to a given therapy changed the way they accumulate mass, whereas resistant cells continued growth as if unaffected. One major advantage of this technique is that it can be done with very small numbers of cells. 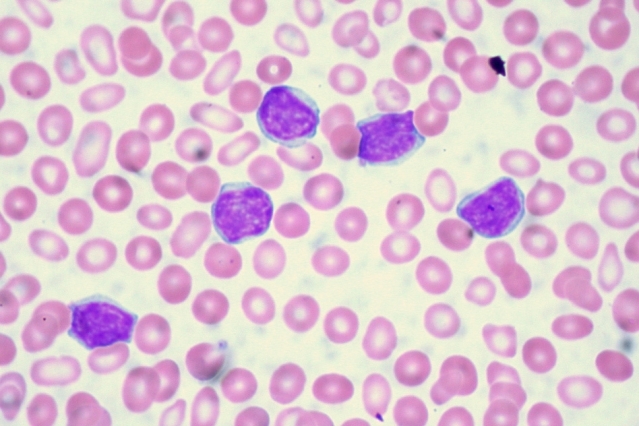 In the experiments with leukemia cells, the researchers showed they could get accurate results with a tiny droplet of blood containing about 1,000 cancer cells. Another advantage is the speed at which small changes in cell mass can be measured, says Anthony Letai, an associate professor of medicine at Dana-Farber Cancer Institute, who is working on a different approach to monitoring cancer cells’ reactions to drugs. The researchers are now using this technique to test cells’ susceptibility and then isolate the cells and sequence the RNA found in them, revealing which genes are turned on. “Now that we have a way to identify cells that are not responding to a given therapy, we are excited about isolating these cells and analyzing them to understand mechanisms of resistance,” Manalis says. In a recent paper in Nature Biotechnology, the researchers reported on a higher throughput version of the SMR device that can do in one day the same number of measurements that took several months with the device used in this study. This is an important step toward making the approach suitable for clinical samples, Manalis says. The research was funded by the Bridge Project, a partnership between MIT’s Koch Institute and Dana-Farber/Harvard Cancer Center, and the National Cancer Institute.